Talk of commercial missions to the moon, constellations of satellites, space tourism, and a trillion-dollar space economy filled the NewSpace conference in Renton Tuesday. There was also a cautionary tale. Commercial space industry entrepreneurs and enthusiasts at a conference in Renton Tuesday talked up the potential money to be made in hyperbolic terms. The leader of one panel, Jeff Matthews, a space industry specialist with consulting firm Deloitte, expressed the hope that the “first space trillionaire” might be “someone in this room” and suggested mining asteroids as one potential route to that pot of gold. Since the conference was last held in the Pacific Northwest two years ago, this region’s local space businesses have offered some examples of success but also a cautionary tale ­— and the latter just happens to be about the ambition to mine asteroids. The annual NewSpace conference originated in Silicon Valley and has the feel of a venture capital festival. Attendees who wanted some grounding in aerospace reality could glance out the window of the conference room at the Hyatt Waterfront in Renton to see two newly built, green-painted 737s parked by the water’s edge at Boeing’s adjacent 737 assembly plant. Inside, the talk was of commercial missions to the moon, constellations of satellites, space tourism, and a trillion-dollar space economy. Several local space firms are succeeding in this new space sector. Spaceflight Industries, headquartered on Lake Union, now employs about 150 and is making money from brokering “rideshares” to space, acting as the middleman to connect satellite manufacturers and researchers with a wide variety of launch rocket operators. Spaceflight vice president of business development Melissa Wuerl said the mobility of that launch vehicle, which can fly close to the equator before launching, means it will be possible to get larger payloads into orbit around the equator. Virgin Orbit plans its first test flight with a rocket strapped underneath next month. Spaceflight expects to have its first launch with Virgin next year. Separately, Spaceflight has already leased space to build a new satellite manufacturing facility in the greater Seattle area. This is the result of an investment in April from French and Italian aerospace firms Thales and Leonardo, which together with am investment from Japanese bank Mitsui and others raised $150 million for Spaceflight’s satellite ambitions. Nick Merski, vice president of space operations at Spaceflight, said the new manufacturing unit, named Leostella, will build high-performance small satellites, including the next 20 small satellites for Spaceflight’s planned constellation of imaging satellites called BlackSky. Merski said the build-out of the manufacturing plant and offices is currently underway – he wouldn’t say where, but it’s rumored to be just south of Seattle – and the company should be manufacturing small satellites later this year. He said staffing will be a mix of existing employees and new hires. “It was important to have the manufacturing facility based in the Seattle area to leverage the engineering talent base and support the growing new space/aerospace culture,” he said. 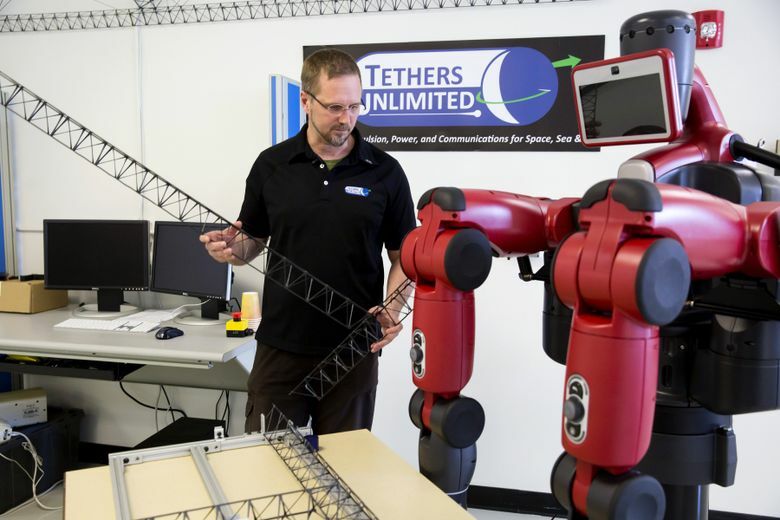 Also thriving in the local space economy is the smaller firm Tethers Unlimited, which employs more than 70 and is led by chief executive Rob Hoyt. Last month, Hoyt announced NASA will send to the International Space Station later this year a 3-D printer he developed that uses recycled plastic to make tools. And this month, NASA announced that it has selected another Tethers technology, the HYDROS water thruster, to be tested in space early next year. HYDROS literally burns water as fuel. It uses in-space electrolysis to split water into hydrogen and oxygen gas, which it then burns to maneuver a satellite in space. The Pacific Northwest has also seen the bleaker side of venture-backed space projects. One of the most hyped companies in recent years was Redmond-based Planetary Resources, which raised almost $50 million to develop technology that could mine asteroids for precious metals. It even did a deal with the government of Luxembourg to get $28 million in backing. Earlier this year, Planetary failed to win a new round of funding, as first reported by GeekWire. After laying off most of its employees, very few remain. On the sidelines of the conference, Chief Financial Officer Joe Landon said the company is still seeking new sources of funding. “We’ll survive,” he said. He compared Planetary’s project to oil and gas industry exploration, which can take 10 to 15 years to pay off and costs billions of dollars to reach that point. Two years ago, in an interview at the 2016 NewSpace conference in Seattle, Planetary chief executive Chris Lewicki conceded that selling off the company’s technology and idea to some big-pocketed corporation was an option, or even a goal. “A lot of companies get founded and their exit strategy is to be acquired,” Lewicki said then. Looking to the future he foresaw either an acquisition by a large company or stock offering in its future. That was when asteroid mining was the next big thing. Yet with no interim revenue ahead of reaching the asteroids, Planetary burned through its money. Speaking on a panel at the conference, Greg Autry, an assistant professor of entrepreneurship at the University of California Marshall School of Business, recalled that it was video games, more than science research or business, that spurred the modern success of personal computers. The space industry is seeking a similar application that will take it beyond 1960s-era moonwalks and orbiting space station experiments. “We haven’t seen that app yet for New Space,” Autry said.